I never thought of NYC as a military city until I read this book. From the Dutch settlement that eventually became Manhattan, New Yorkers have always lived under the threat of conflict, and sometimes in the midst of conflict. This great work of history takes you through NYC from the days of Dutch colonization, English colonization, the Revolutionary War, the War of 1812, the US Civil War, the Cold War, and the various terrorist attacks that New York has experienced throughout its history. New York at War is a fascinating and well-researched book chronicling the centuries of warfare that have plagued the city from its inception under the Dutch to modern day terrorism. I was surprised at the amount and fierceness of fighting that the city has witnessed. From the Civil War race riots to the bombings by the FALN, Steven Jaffe remembers many forgotten instances of violence. However, his strongest point is that New York shows its true colors during these periods of unrest, both good and bad. Throughout history the city has been in fear of attack from both inside and outside, and violence has often erupted between fellow New Yorkers. The parallelisms between NYC of the past and present are very insightful. In short, the city, being at the crossroads of the world, has always been plagued by conflict, foreign, racial, economic, political, and sociological. It will forever remain a symbol of America and modernism, forever making it a tempting target for all those who oppose. Great read recounting the history of New York City's experience with war. From the first days of New Amsterdam to the current concerns of the War on Terror, America's largest city has been no stranger to conflict with enemies from without and dissension from within, and this book recounts that perfectly. 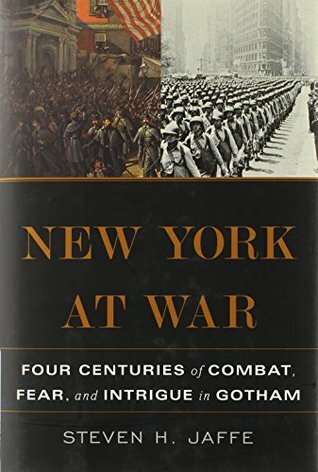 A very good history of the city of New York during times of war. I never really thought about New York in a military context, unlike other places that have been directly affected (London, Paris). This book does a very good job of showing both the vulnerability and resilience of New York and its citizens throughout American history. I only read the first half, which covers Dutch settlement through the Civil War. Those are the eras I'm most interested in when it comes to NYC history. It's good; lots of historical detail but it kept my interest. I'd recommend it to anyone who's a New York history geek like me. Fascinating interview with author on John Batchelor Show re the Indian, Dutch, Revolutionary, Civil, World, and Terror wars in NYC.